Why my first Hair Botox experience was a complete fail. A couple of weeks ago, I excitedly shared with you the Hair Botox hair treatment. What made it so amazing was the idea that one could infuse their hair with amazing ingredients without any concern for harmful chemicals. My options were to visit a salon for the treatment or purchase the system online and attempt to do it at home. The prices for the product online was not cheap but I figured that it would even out considering how many applications were in one package. After a little reflection, I decided on Kashmir's Hair Botox. When the package arrived, on wash day, I was absolutely stoked! After getting familiar with the instructions, I prepared for my first Hair Botox experience. To start off, you're required to scrub the hair clean, using clarifying shampoo, to create the ideal environment for the product to penetrate. Once that's complete, you dry the hair as much as possible before beginning the process. Once my hair dried, I mixed two products in the package together (per instruction), divided the hair into 4 sections, and proceeded to apply. When I first opened the package, I took a whiff of the "smoothing treatment" that came was part of the system. Everything smelled nice, so no alarms went off. The treatment had a light consistency and was fairly easy to apply. Per the instructions, I began applying the product from root to tip, making sure that everything was evenly applied. Then something interesting happened. I noticed my eyes start to get irritated and water. At first I brushed it off because it didn't seem like a big deal. Onward, I continued applying product. The more I applied, the more irritation I experienced. At this point I'm wondering if I'm really having a reaction to the product or if I'm imagining it. I NEVER react to anything. I don't consider myself sensitive and I have no allergies. But there was no denying how much my eyes were burning at this point. Immediately I grabbed the bottle and scanned at the ingredients. In my haste and excitement, I neglected to look review the ingredient list beforehand. There it was, in the second line of the ingredient list--formaldehyde. I was shocked! That was the absolute last ingredient I expected to see on the list. At this point I had a decision to make. The fumes were rising in the air and I had to act fast. I tried my best to keep applying, but eventually, the irritation became unbearable. I jumped in the shower and gladly washed it out. The directions state that I should blow dry and flat iron after rinsing but I was afraid of causing more inhalable toxic fumes with the addition of heat. One the ordeal was over, I contacted the company and exchanged a few messages. 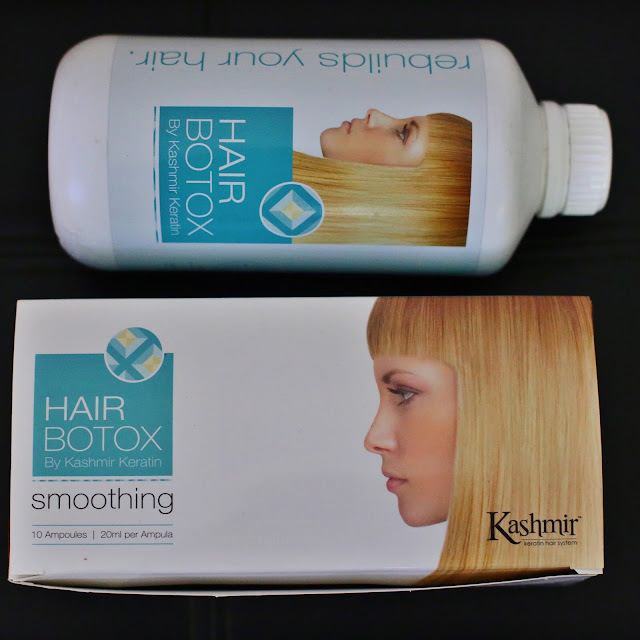 It turns out they offer a formaldehyde free version of hair botox called Hair Biotex. I, unfortunately, was fooled by the marketing tactics of using the words "Hair Botox" on a keratin treatment product. Although I was extremely bummed, I still longed for the true hair botox experience. That's the reason I decided to try again with a truly formaldehyde free formula. The replacement product has arrived and the first thing I did was check the ingredients to conform that it was true Hair Botox treatment. Once I get a chance to try Majesty Hair Botox, I'll do another update. oh wow! what a horrible experience. How is your hair doing, any negative effects? btw, are these products safe to use on top of relaxed hair? You are so brave to try all these things! Oh no, I was going to try the same brand. Thanks for sharing. @ Neo, thankfully, I still have hair on my head. Actually, my hair felt great when I deep conditioned after rinsing the treatment out so i'm hopeful about the next experience. The thing that ruin your hair with those treatments is not the formaldehyd but the heat you must use to activate the formula. You won't get lasting results unless you flatiron on a high temperature. Ohhh!!! very sad to hear that. i think it was unfortunately happened to you. Otherwise botox hair treatment gives good result because recently i have also take this treatment and i am fully satisfied with it.